The four Major Houses–Blue Ravens, Red Flowers, Yellow Goblets, and Green Harps (sounds like breakfast cereal)– are the source of most of your points but are limited do not easily join within a single COURT. The Minor Houses are numerous but provide fewer points. They are also mercurial in their support and always display allegiance to more than one Major House. Sharing of power is never easy, but occasionally a Major House may find common cause with another. ACCORDs allow two Major Houses to connect within a single COURT. No one is immune to FATE. The vices of the royalty of a court makes them particularly susceptible to Fate. Fate strikes without preamble and removes the powerful from COURT in a blink of an eye. A FATE card identifies who is targeted by rank or class on the face of the card, i.e ‘King’, ‘Queen’, ‘Prince’, ‘Tower’. ‘Royals’ indicates any member of a Major House; ‘Mortals’ indicates any human member of a COURT. The court is in disarray, no family sits the throne. The support of the various minor houses are for sale and the Major Houses are jockeying for power. Now is the time for a clever strategist to build a new coalition to seize control and bring the houses and peasants behind a new ROIL Family. 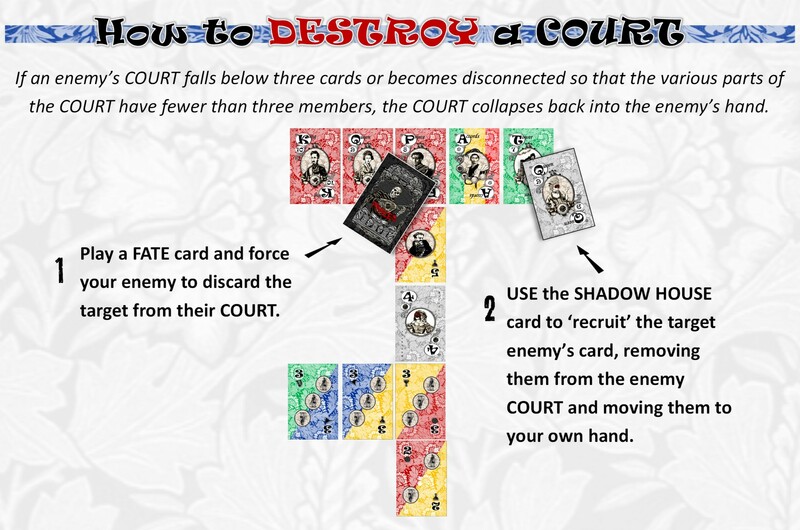 In Roil, you are the power behind the throne, bringing members of the Major Houses, the lords of the Minor Houses, and the Peasants to form a new court before other powers can act. 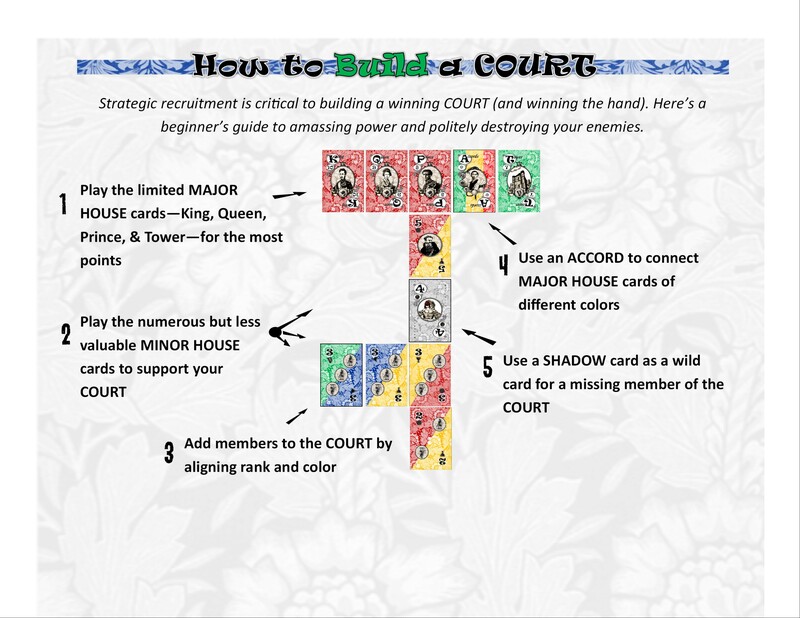 To build your court, you have Accords to bind the Major Houses, the hands of Fate to diminish the Courts of your rivals, and the members of the elusive Shadow House to recruit members of other courts or stand in stead of missing members of your own. Building your COURT and abusing your neighbors. How to Build the Perfect Court. Devious Deeds in Dark Corners Using the Shadow House. Applying Strategery to your peer relations with an ACCORD. The fickleness of FATE is infinite.